Companies of all sizes are concurring to the exponential growth of the Sicilian shipping industry and those succeeding in overcoming the handicraft phase are becoming successful on an international level, such as Aquamar. The yard, especially careful in applying a strict price policy, is extending its range of vessels thanks to the introduction of the new Eolica Boat line, aims at a foreign public. The yard, founded by Lucio Melita and Luigi Bertè, joins the fray of the most pressing competition with the new Aquamar 615 by resorting to the ever-delicate question of quality/price ratio. 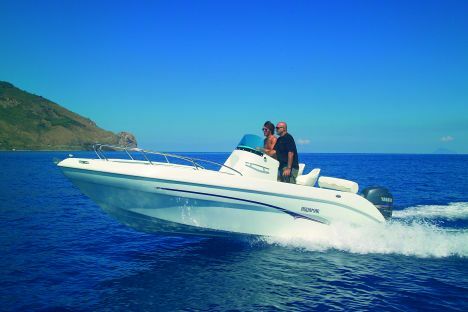 Smooth at the wheel and in tune with the fantastic Yamaha 150 hp Four Stroke engine, this comfortable boat with central dashboard perfectly supports the thrust of the test boat power and the considerable weight of the four-stroke outboard. 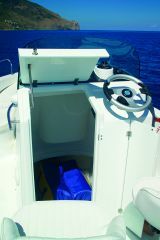 The outboard engine seems to float with nonchalance on the transom, statically and dynamically supported by the large and efficient hull. Comfort at different cruising speeds and trim angles is definitely above average thanks to the adequate arrangement of grabrails and to the suitable design of side decks. 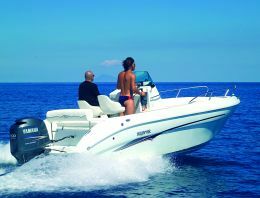 Aquamar 615 has top quality finishing and by suitably choosing from the list of optional fittings, the boat may be customized to one's own requirements. Price with standard fittings, no engine: Euro 12,300.00 ex yard. Electrical switchboard and plants: excellent, with watertight switches on the dashboard.